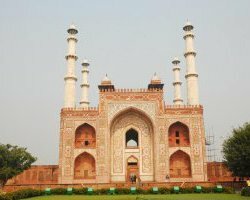 Akbar’s Tomb (Sikandra Tomb) is one of not to be missed attractions on Agra sightseeing tours in India. It is a beautiful tomb monument situated in approx. 119 acres of grounds in Sikandra, an important suburb of Agra city in Uttar Pradesh, India. It is a tomb of the great Mughal Emperor Akbar, and regarded as an important Mughal architectural masterpiece. This beautiful mausoleum monument was constructed in 1605 - 1613 by his son prince Salim later called Jahangir. The planning of the tomb and site for the tomb was made by Akbar himself. After his death, his son Salim (Jahangir) completed the construction. The architecture of the Akbar’s Tomb is magnificent and appealing. It is considered to be as very important Mughal architectural masterpiece because of its beauty and decoration work. The largest gate to the tomb complex is the South Gate with four beautiful white marble chhatri topped minarets. Minarets are similar to those of the Taj Mahal. The South Gate is the main and normal entry point to the tomb. The entire tomb complex is ornamented in beautiful geometrical, floral and calligraphic designs. About 1 KM away from the Akbar’s Tomb, there is the Mariam’s Tomb, the mausoleum of Mariam-uz-Zamani, the wife of the Great Mughal Emperor Akbar and the mother of Emperor Jahangir. The Tomb of Mariam-Uz-Zamani was built by Jahangir in the loving memory of his mother Mariam-Uz-Zamani, the Hindu consort of Emperor Akbar. No Agra tour is complete without visiting the famous Akbar’s Tomb at Sikandra. Majority of tourists coming Agra to visit the Taj Mahal and Agra Fort also visit the Sikandra Akbar’s Fort. You too should not forget to visit this wonderful architecturally beautiful monument on your Agra city tour. Exploring the Akbar’s Tomb complex and attractions within the complex will remind you how Mughal were very fond of beautiful architecture. You will have great experience to cherish for life time after visiting the Tomb Monument of Akbar at Sikandra.